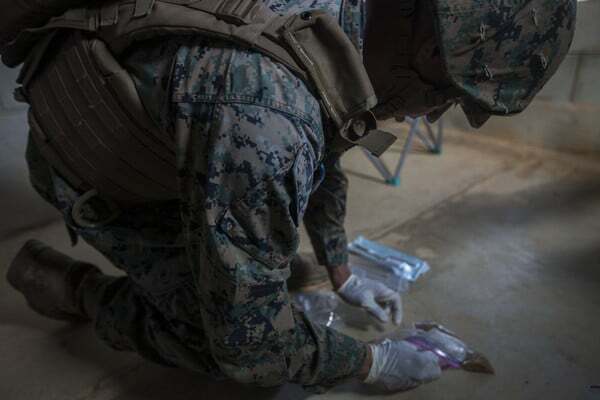 The Marine Corps is enhancing an existing forensics exploitation capability used to differentiate between friend or foe on the battlefield. The Corps is updating the Expeditionary Forensics Exploitation Capability, or EFEC, with newer IT technology. The EFEC is a portable forensic laboratory used by Law Enforcement Battalions to recognize, collect, analyze, preserve and store data. The EFEC was fielded in 2013. Since then, the Identity Operations Team at Marine Corps Systems Command has decided to update the some of the system’s IT equipment. Maj. David Bain, EFEC project officer, believes employing more up-to-date equipment can benefit Marines on the battlefield. “We want to improve the lethality of Marines in the battlespace by collecting and sharing data faster than we were previously able to,” said Bain. The EFEC is organic to the Marine Air-Ground Task Force and capable of exploiting forensic material to support forensically enabled intelligence. This includes device and digital media analysis, latent and patent print, DNA, and the collection and identification of other elements that can be forensically tied to activities. The Identity Operations Team is working to integrate the EFEC with other intelligence systems to give Marines the ability to gain insight and information of immediate tactical value on the battlefield. “EFEC complements and integrates with the other Identity Operations capabilities, such as Identity Dominance System-Marine Corps and the Marine Corps Intelligence Agency Identity Intelligence Analytical Cell, or MCIA I2AC,” said Swift. The MCIA I2AC reviews the IDS-MC and EFEC user’s submissions and other collected data to provide direct support to the submitting Marines. The I2AC rapidly produces analysis reports and related products for persons of interest and shares this information, with the collected data, throughout the Defense Forensics and Biometrics Enterprise. MCSC is assessing science and technology agile acquisition efforts now to develop and field the next increment of EFEC capabilities by fiscal year 2021. “Marines want more expeditionary, rugged and lightweight equipment with fewer pieces, and we are making that happen with the EFEC,” said Bain. EFEC is a portable, expeditionary forensic exploitation laboratory that includes four collection kits. These kits provide squad-level tactical forensic collection capability for proper collection and preservation of evidence. The chem kit allows operators to detect and identify hazardous and forensically relevant chemicals. The lab kit helps Marines process digital evidence, and the mobile kit helps to analyze and recover information from mobile devices. Lastly, the site kit enables the operator to gather key forensic information, such as taking fingerprints and preserving liquids, at any location of interest. MAGTF expeditionary forensics is one of three pillars within the USMC Identity Operations Strategy 2020 Implementation Plan. To fulfill the Marine Corps Operating Concept, MCSC continues to seek and provide Marines relevant, innovative and rapid solutions to enhance warfighting capabilities, Swift said. “It’s important that MCSC continues to advance with technology and we stay agile with our incremental acquisition approach to evolve current capabilities,” said Swift. Matt Gonzales contributed to this story.